Every individual 18 years of age and older must present a valid driver’s license, state issued ID card or International VISA to tour the dam. 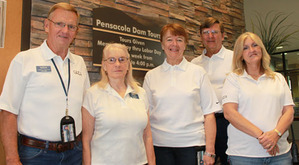 When the calendar reaches late May and the country celebrates Memorial Day weekend, the Grand River Dam Authority begins something very special at historic Pensacola Dam in Langley. That holiday weekend marks the beginning of the free tours of the dam, which originate at the GRDA Ecosystems and Education Center and allow guests to get an up close look at Oklahoma’s first hydroelectric facility. While many turn their attention to the waters of Grand Lake during this time of year, a tour of the dam is an opportunity to see where the lake really begins. In the summer of 1940, as construction crews were nearing completion on the massive mile-long dam that crosses the Grand River Valley between the communities of Disney and Langley, the lake began to fill. Ever since, Pensacola has held back the 46,500 surface acres of water that support a thriving recreational and tourism industry in Northeast Oklahoma that also spills over into the surrounding states. The interior of the dam still appears much as it did in 1940, which is one of the reasons it was added to the National Register of Historic Places in September 2003. On a guided tour of the dam, participants will first have the opportunity to watch a video, detailing the construction of the dam as well as the beginnings of GRDA and is operations today. After that, the tours proceed to the powerhouse, accessed via elevator from above. Inside that powerhouse, GRDA still produces renewable electricity, just as it has for over seven decades, by harnessing the flowing waters of the Grand River. The six hydroelectric turbine generators located there have the combined capacity to produce approximately 120 megawatts of electricity for GRDA customers in Oklahoma. During its construction, critics claimed there would never be a market for all the electricity the dam would create. Today, however, Pensacola’s total generation output is a small portion of GRDA’s overall mix of coal, gas, wind and other hydroelectric generation resources. However, the dam remains an important part of that generation mix, as well as the cornerstone for the GRDA lakes region in Oklahoma. The free tours of the facility, as well as a visit to the GRDA Ecosystems and Education Center, allow guests to see some of the positive impact that Pensacola Dam has on Oklahoma, in terms of low-cost, reliable electricity, economic development and environmental stewardship. If you are planning to take the tour this summer, keep in mind that every individual 18 years of age and older must present a valid driver’s license, state issued ID card or International Visa to tour the dam. The free tours are given daily (9AM – 4PM), between Memorial Day and Labor Day weekends. At other times, GRDA does offer off season tours for 10 or more people. Those are scheduled based on tour guide availability. For more information, contact the GRDA tour desk at (918) 782 4726. Please call the tour desk for more information.